CS-Cart (lifetime license) is ready-to-use PHP and MySQL based software for online stores with an open access to the source code. This solution with easy-to-use interface allows to start selling online immediately. Its feature set fits into businesses of any size, from a small single-product shop to a full-featured online store with several independent storefronts. This is a lifetime CS-Cart license. Once you purchase and activate this shopping cart tool, you can use the CS-Cart eCommerce software without any time and functionality limitations. With the license, over 500 e-commerce features are at your service including the eBay Synchronization. 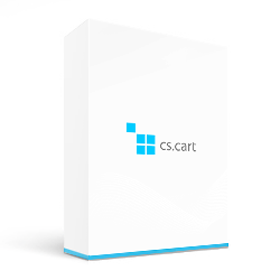 The CS-Cart license ships with a free 1-year upgrade subscription, which allows you to get new CS-Cart software versions for free during one year since the moment of the purchase. Upgrades fix issues, update integrations with payment and shipping services, and, of course, add new eCommerce features. Plus, the license includes 50 support credits.